Are you struggling with dizziness, balance problems or vertigo and live in the Maroochydore area? Then we’d like to help you. Our ability to balance and stay upright is something we usually take for granted… until we lose it. 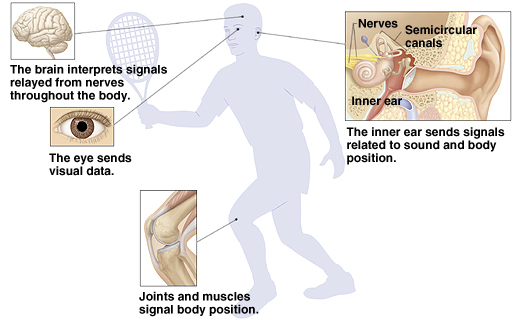 This ability is a complex interaction of our eyes, our balance organs in our inner ear (the vestibular organs) and the sensation from our joints and muscles (usually our feet on the ground). All this information is processed by the brain which then allows us to balance. Why Do We Get Problems With Balance? A person can become disoriented if the sensory input received from his or her eyes, muscles and joints, or vestibular organs conflictswith one another. For example, this may occur when a person is standing next to a bus that is pulling away from the curb. The visual image of the large rolling bus may create an illusion for the pedestrian that he or she—rather than the bus—is moving. However, at the same time the proprioceptive information from her muscles and joints indicates that she is not actually moving. Sensory information provided by the vestibular organs will further re-inforce that they are in fact stationary and not moving. If any one of those systems is “a little off” and is over or under active – you can imagine how unsettling that can be and this is where people get the feeling of spinning or movement when they are in fact still. When this happens it is called Vertigo – you may feel the room spin around you or that you are spinning around the room. There are many causes of balance issues. A thorough history and examination should be done to investigate the three sensory organs (eyes, vestibular system and muscles and joints) and determine which of these is contributing to the balance problem. Can You Help My Balance Problem? Once the cause of your balance problem has been identified, in many instances something can be done. Often we can identify an area of the balance system that is “weak” and not doing its job as well as it should. Tailored exercises based on your balance issue can then be used to help strengthen the weak area. Just like going to the gym and getting fitter and stronger, the same can be done for your balance system. Dr Leevi from Wises Road Chiropractic has completed post graduate studies in Chiropractic Neuro-Rehabilitation. He has a keen interest and has worked extensively with balance and dizziness issues.